Muscles of Facial Expression are unique in that they migrate to their destinations about the scalp, neck, and mostly about the face from second pharyngeal arch mesenchyme and thus receive their motor innervation via the facial nerve (CN VII), the nerve of the second arch. Although most of these muscles originate on bone, most do not insert on bone; rather, they insert into the dermis of the skin and freely intermingle with muscles in their vicinity. Upon contraction, this arrangement and groupings of muscles about the orifices of the face convey movements about these orifices that we interpret as emotions. The muscles of the face (and scalp) are derived from the second pharyngeal arch (hyoid arch) mesenchyme that migrates to its final destination. Considering the origin of these muscles, it is not surprising that they receive motor innervation from branches of the facial nerve (CN VII). Rather than inserting into bone, these muscles insert into the dermis of the skin, thus their orchestrated contractions convey various shapes to the face that we interpret as emotions. It is important to understand that fascicles of these muscles intermingle with each other, and they tend to act in groups to control the orifices around which they are grouped, such as the orbit, nose, and mouth. It is according to this grouping that they are described. The three external muscles of the ear are the auricularis anterior, superior, and posterior. Similarly, the three muscles of the nose are the procerus, nasalis, and depressor septi. These two groups of muscles are fairly inconsequential. The orbicularis oculi muscle is composed of two parts, the palpebral portion and the orbital portion. The former originates from the medial palpebral ligament (attached to the medial aspect of the orbit) and inserts into the lateral palpebral raphe (attached to the lateral aspect of the orbit). The orbital portion of the muscle describes an oval around the orbit. The orbicularis oculi is innervated by the temporal and zygomatic branches of the facial nerve and acts to close the eyelid completely. Forceful closure is mediated by the orbital portion, whereas the palpebral portion is responsible for light closure, as in blinking. The corrugator (supercilii) muscle is located deep to the superomedial aspect of the orbicularis oculi, at the medial aspect of the eyebrow. It originates at the medial extent of the superciliary arch and inserts into the skin of the eyebrow. It is innervated by the temporal and zygomatic branches of the facial nerve; the combined actions of the paired muscles approximate the eyebrows, producing frowns. The orbicularis oris completely encircles the mouth. Its fibers are positioned at various depths and angles in the two lips. Fascicles of this muscle, some of which are derived from those of neighboring muscles—especially the buccinator—freely intermingle with fascicles of other muscles acting on the lips, permitting extensive movability. Many of the fibers of the buccinator cross over each other at the angle of the mouth so the upper fibers proceed to the lower lip and the lower fibers to the upper lip. Hence, the origin of the orbicularis oris is complex and is usually considered to be from the fibers of the surrounding muscles as well as from the alveolar portion of the maxilla, the septum of the nose, and the area lateral to the incisive fossa of the mandible. Insertion is into the skin and into itself, forming an ellipse around the mouth. Buccal branches of the facial nerve innervate this complex muscle, which closes the lips and, during stronger contraction, purses them, as in osculation and whistling. The risorius is a small, horizontally placed muscle that originates in the masseteric fascia and inserts in the skin of the corner of the mouth. This is the smiling muscle; it is responsible for drawing the corners of the mouth laterally. The risorius is innervated by buccal and mandibular branches of the facial nerve. The depressor labii inferioris is quadrangular in shape. It originates on the medial extent of the oblique line of the mandible and inserts into the skin of the lower lip. It acts to depress the lower lip. The depressor anguli oris (triangularis) originates on the oblique line of the mandible and inserts into the skin of the corner of the mouth and depresses it, expressing sadness. The mentalis is a small muscle of the chin. Its origin is in the incisive fossa of the mandible, and it inserts into the skin of the chin to wrinkle it and also to protrude the lower lip, as in drinking. The platysma was previously detailed in Chapter 7. 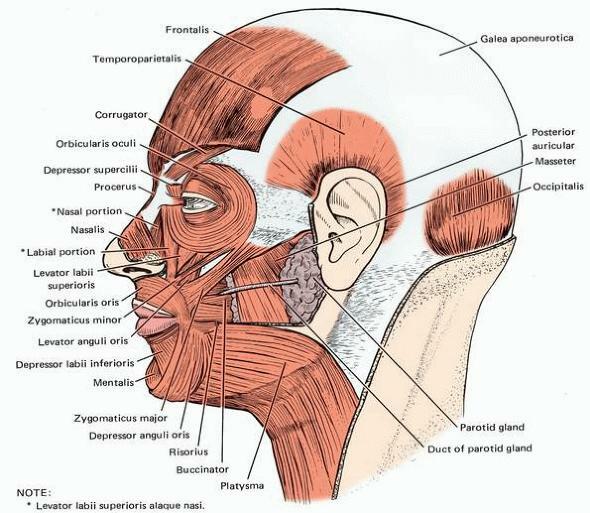 All of the muscles of this group, except the platysma, are innervated by the buccal and mandibular branches of the facial nerve. Five muscles elevate the lip and corner of the mouth. The levator labii superioris alaque nasi is the most medial of these muscles, originating from the frontal process of the maxilla passing inferiorly along the side of the nose. It then splits into a medial and a lateral portion to insert into the wing of the nose and into the upper lip. This muscle functions in dilating the nostril and raising the upper lip. The levator labii superioris originates from the maxilla and zygoma just inferior to the orbit. Its fibers pass across the infraorbital foramen to insert into the upper lip, lateral to and intermingling with the fibers of the levator labii superioris alaque nasi. The levator labii superioris elevates and protrudes the upper lip. The levator anguli oris lies deep to the levator labii superioris. It originates below the infraorbital foramen, from the canine fossa of the maxilla, to insert into the corner of the mouth. This muscle elevates the angle of the mouth and assists in the formation of the nasolabial furrow. The zygomaticus minor, a slender muscle arising from the maxillary process of the zygomatic bone, inserts just lateral to the insertion of the levator labii superioris muscle. This muscle elevates the upper lip. It also assists in the formation of the nasolabial furrow. The zygomaticus major is the lateral-most muscle of this group. It originates on the temporal process of the zygomatic bone and inserts into the corner of the mouth. This muscle elevates the corner of the mouth and pulls it laterally. All of the five muscles acting to elevate the lips are innervated by the buccal branches of the facial nerve. The buccinator, a quadrangule-shaped muscle occupying the space between the mandible and the maxilla, is the primary muscular component of the cheek. It lies deep to the muscles of facial expression and is separated from them by the buccopharyngeal facia and the buccal fat pad. The parotid duct pierces the substance of this muscle to enter the oral vestibule. The buccinator originates on the maxilla and mandible, specifically on the buccal surfaces of the alveolar processes in the vicinity of the three molars, and from the pterygomandibular raphe, a collagenous tendinous inscription attached to the pterygoid hamulus and the mylohyoid line of the mandible. This raphe is interposed between the buccinator and superior pharyngeal constrictor muscles. The buccinator inserts into the fleshy corner of the lip in such a fashion that the upper fascicles and the lower fascicles decussate at the corner of the mouth and insert into the lower and upper lips, respectively, becoming fibers of the orbicularis oris. The highest and lowest fascicles, however, continue without decussation into the upper and lower lips, respectively. The buccinator muscle acts to press the mucosa of the cheek against the teeth, thus aiding in mastication and deglutition. In addition, it assists in distending the oral vestibule and forcefully expelling air, as in blowing dust particles off a surface. The buccal branch of the facial nerve innervates this muscle.